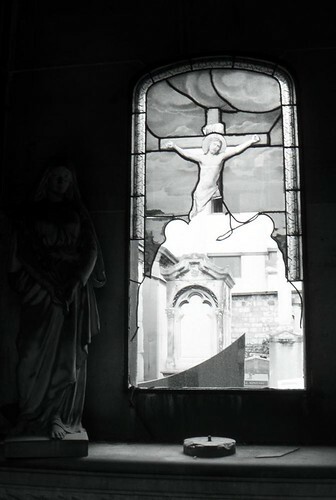 Mary and Christ window in Montmartre, originally uploaded by Ted Drake. The tombs in the Montmartre Cemetery are filled with small altars and still life presentations. Many of them are like this photograph. A composition of Mary and Jesus, celebrating the Catholic roots of the French people. Other tombs may have more familial arrangements with photographs and favorite objects. Some include flowers, while others have greco statuary. I am fascinated by the play of light, color, and objects within these tombs. While most people will look at the outside structure and the name upon the plot, the real interest lies within. I believe this was shot on a Nikon N90 with Agfa Scala 200 on a 35-80 zoom lens.